The Clegg Coup is an insider's account of a rise to power that horrified the political establishment. In three weeks the Liberal Democrat leader went from being David Cameron's favourite joke to his deputy prime minister and apparently the most popular British politician since Churchill. But far from being some over-night TV sensation, this triumph was the culination of half a century's work by Liberals, a process the book will explain. It will also catalogue the rise of Clegg and what has gone on inside Number 10 since that blosom filled day in the Downing Street rose garden when two implacable enemies announced they were forming a government. This will include first hand accounts and diaries from cabinet ministers and other leading players on the negotiations and their groundbreaking attempts to run a coalition government. The story includes many rows but also some remarkable friendships. Gerard has unique access having known Clegg and many of the key players for many years. He started writing about Clegg in newspaper columns when the young MP was still virtually unknown, and conducted the interview that launched Clegg's leadership bid. The book is an admiring portrait of an impressive new force in British politics but it also quotes prominent colleagues who remain sceptical of Clegg-Cameron duopoly and explore where on earth it might lead. "Explosive...The book all Westminster is talking about." 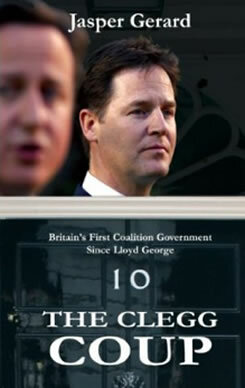 "Just finished reading Jasper Gerard’s The Clegg Coup. Insightful, frank, fair-minded. And brilliantly well-written. " Stephen Tall, editor of Liberal Democrat Voice. "A masterful account of coalition government." "In his new study of coalition Government, Clegg’s Coup, Jasper Gerard – a friend of the Deputy Prime Minister - argues that the Liberal Democrats needs to exchange what he says one minister calls “fluffy bunny voters”, the idealists who prefer ideological purity to power, with realists (wily foxes?) who are willing to make the compromises required by Government. The “coup” he describes is Mr Clegg’s attempt to turn his party from “some pressure group of perpetual and immature opposition” to a “centrist, liberal party of coalition” of the sort seen on the Continent. There are, he believes grounds for optimism for the Lib Dems in an age that is about “the inspiration and invention of the individual not the march of the masses." "Jasper Gerard is not only a journalist with a national profile and a highly engaging style, but he is also a passionate liberal and Liberal Democrat, and he has written a book which is readable, sympathetic, well sourced, thoughtful and never, ever, dull. It is clear that a quite a few senior Lib Dems have co-operated with the author to help him to tell his tale, and party and political insiders will enjoy trying to match up many an anonymous quotation with the list of those who have assisted the author, which appears at the beginning of this volume. Jasper Gerard is an entertaining author, and his account races along in a way that is often amusing and always accessible, even when he is dealing with the intricacies of the Orange Book or deficit reduction strategy.Since leaving the Westminster world, Jasper Gerard has sharpened his pen in the world of journalism, and his party sympathies are counter-balanced by his determination to tell the story of Nick Clegg’s rise with honesty and discrimination. This is the best inside account yet available of the rise of Nick Clegg and his brand of liberalism, and it gives a comprehensive account of how and why the Liberal Democrats formed the first real Coalition Government in Britain for over half a century. The book ends with a series of thoughtful chapters about the challenges now faced by Nick Clegg and the Lib Dems, both in Government and as the Party seeks to win back voters in the General Election of 2015. This reminds us that the story of the “Clegg Coup” has a lot further to run. Jasper Gerard will need to pick up his pen again soon to write a second volume"
"Jasper Gerard shows far more knowledge of the party’s internal workings than nearly all other writers. The book is a great read for its stylish commentary which shows both inside knowledge and understanding of the Liberal Democrats."